Very early this year, it was clear intention of Sony and LG to come hard this year and as the first quarter is about to end, both have come up with many smartphone in their range. Sony discontinued for Ericsson and they would be happy with that relationship now. Earlier this year we showcased you the list of upcoming Android smartphones by Sony brand and as expected these phones are coming out one by one. Here in this article, this time we get leaked specifications and features of Sony Pepper MT27i. This leaks come from the unpublished official site of Sony Corporation China revealing the features, specifications and photo of the Sony Pepper MT27i smartphone. Accordingly to the leaks, Sony Pepper would be powered with Android 2.3 Gingerbread operating system and it will be mid range smartphone with modest specifications. This is the clear indication that it will not be powered with quad core and dual core processor is highly likely. As of now we don’t have any clear specifications but we got enough specifications to put it on our blog as a news. Sony MT27i Pepper is believed to be the successor of Xperia Neo V and it improves in various aspects. 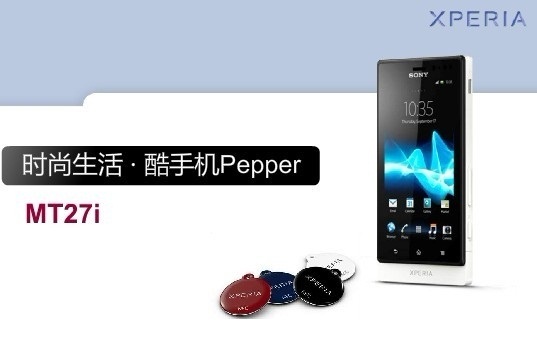 Sony Pepper will come with 3.7 inches FWVGA display screen with 1 Ghz dual core processor. The screen will provide 854 x 480 pixel resolution with reality display provided by Sony. It’s expected that battery specifications standing at 1320 mAh and accordingly to the photo it will come with button LED lamp just like the torch for any notification on the phone. It will come with 5 mega pixel rear side camera which allows users to take photos at a vivid quality and its possible to take 720p HD videos along with playback. Along with that it also adds front facing VGA camera just beside the LED lamp button. Its certain that phone will receive an Android 4.0 Ice Cream Sandwich once after a month when the phone is arrived to the users hands. This phone comes with Xperia Smart Tags which allows users to change the profile on their needs. They just need to add the tags wherever they keep it and your phone would be automatically tuned to that profile when you enter the smart tags vicinity. This phone also comes with Wi Fi Direct function to allows file transfer from one phone to another at a faster rate over Wi Fi and NFC allows users to tap and share content easily in clicks. Sony Pepper MT27i might be the code name of the phone but it looks like this would be the official name of the phone. We never when this leaks turns out to be true. As far as we know this phone will be announced in April 2012 and will soon debut in most of the countries within a month or two. The expected price of this smartphone is 310 Euros.